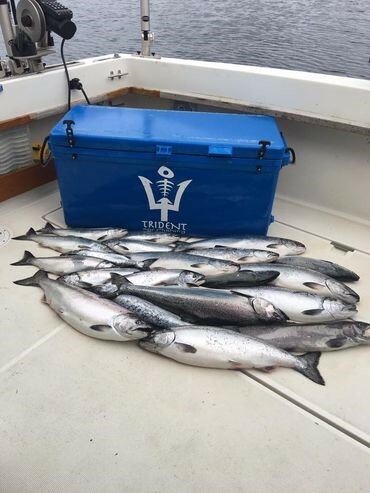 Reel Action Fishing Charters has now merged with Trident Sport Fishing to provide our customers with the best possible fishing experience they can have. Everything has stayed the same, still great fishing and the best experience you will have on the water. Feel free to contact us for further questions about your next fishing trip. Captain Jeff 616-607-6326. We love to share our experience with anglers of all levels. Whether it is your first time fishing or your 100th time, we promise to show you a good time. We average 6 days a week on the water which allows us to keep up with the always moving and sneaky game fish of Lake Michigan. Lake Michigan Charter Fishing at its best is only a click or call away. When you book with Trident, your safety and comfort is our #1 priority! We provide top of the line safety gear and equipment on board our meticulously maintained 31' Tiara. Your trip will consist of meeting at the dock, checking licenses and safety overview, depart dock, fish, have fun, return to dock, clean and package your catch. We do all the work and you have all the fun (don't let us kid you, it's fun for us to)!